If you’ve never heard of split-belt treadmills then you might want to consider yourself lucky. The type of person who needs these machines are generally those who have suffered from strokes or have other neuromuscular problems and must learn how to walk again. Made by Woodway, split-belt treadmills are the latest in innovative technology to help rehab patients “re-wire” their brains to command their legs to move. Scientists have discovered that the brain has the ability to relearn locomotor skills including coordination and walking motions. The repetition of a function, such as motor skills, in which the brain must reorganize and adapt, is known as neuroplasticity. For example, as a patient practices leg movement on a treadmill with a split belt, the central nervous system restructures neuro pathways in order to mimic the walking motion. Treadmills with split belts have two platforms which are used to separate the nerve networks that control the movement of each leg. If you can visualize two parallel tread belts, with one side moving at a different speed than the other side, you’re getting the idea. Since our brain can direct our legs to function independently of each other, the machine works by moving one foot forward while moving the other foot backwards, simulating a normal stride. The patient is then able to reacquire the coordination needed in the swing phase of the leg as well as the necessary foot clearance. It’s not the active conscious movement the researchers are targeting, but the unconscious control system that will hopefully take over and cause walking motion to once again become second nature. In addition, these split-belt medical and research machines have an 800-lb user weight capacity, and the treadmills are equipped with removable side rails so the patient can support himself. Walking Again, and Walking Well! 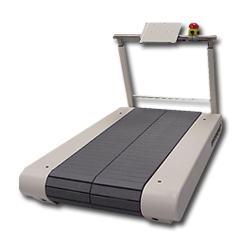 Woodway treadmills have been used by rehab centers in therapy and conditioning with excellent results. Not only have many stroke patients learned to walk again, but gait impairment has been corrected, which in turn lessens the chance of other types of injuries, such as hip problems. The repetition of a correct walking gait has been central to reawakening use in parts of the brain once thought lost forever. Studies show that not only is the brain relearning these functions while on the split-belt treadmills, but it continues to hold that gait motion for a time after moving off the treadmill. It not only works on the muscular response but it improves the circulatory system as well.